Many of these designs are as pretty to look at as they are functional so it is like getting art and a storage system in one! 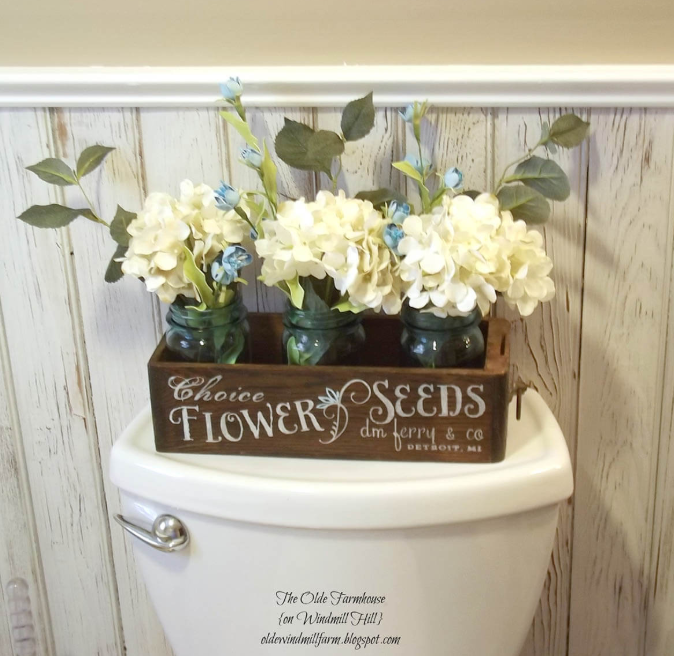 Because most of these projects are DIY, they are totally customizable so you can give your bathroom a farmhouse feel regardless of its size or shape! 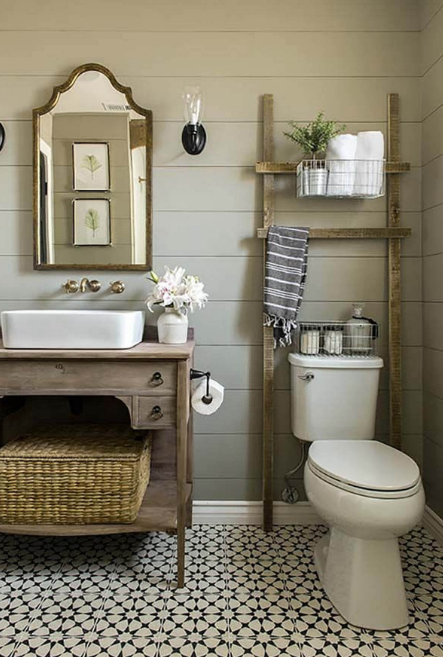 From unique vanities to fun storage solutions, this list of farmhouse bathroom design inspiration has everything you need to take your space from boring to beautiful! Read on for tutorials, shopping lists, and more for each of these 36 awesome ideas. 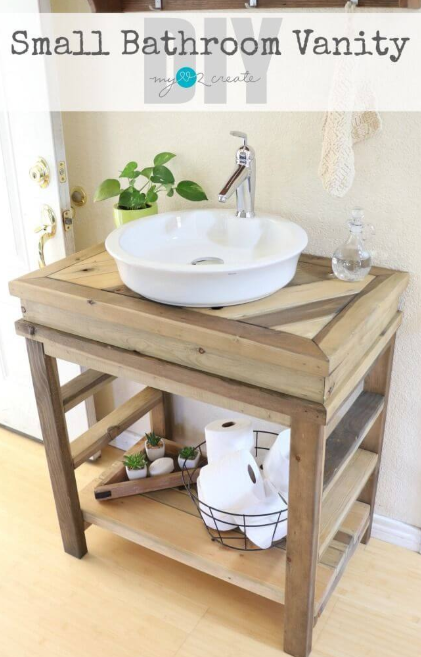 Sophisticated with rustic touches, this bathroom design won’t go out of style anytime soon. The soft gray shower, clean white cabinets and square white sinks keep it bright and classic. Wooden framed mirrors and copper fixtures add warmth. The navy geometric rug is a fun accent! 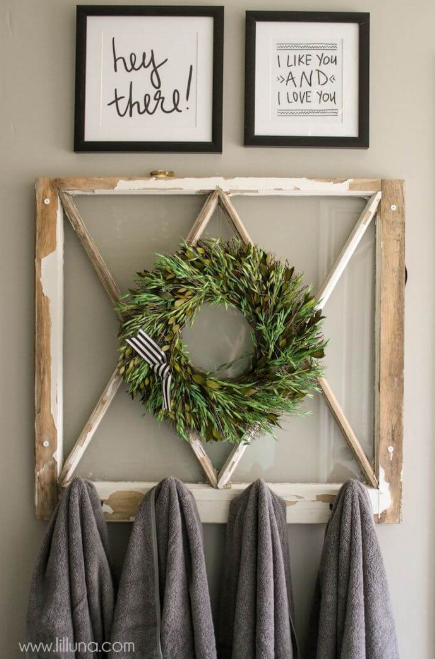 Upgrade your stick on bathroom hooks to this shabby chic accent piece. Both attractive and useful, it doubles as a towel holder and a beautiful wall decoration. The unique triangle design and boxwood wreath add visual interest. 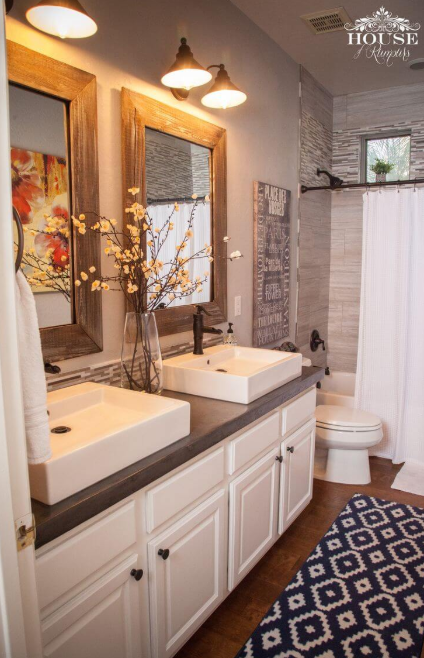 This bathroom takes the farmhouse look to a new level. There’s nothing boring about the neutral colors with the different textures and colors of the stone, wood floors, and wooden beams. The sliding barn door is a stunning touch that pulls it together. Here’s a great way to decorate a necessary part of the bathroom – the toilet. This vintage style wooden crate filled with blue tinted mason jars and white hydrangea blossoms is a sweet way to spruce up the space. The details come together in this bathroom design that’s full of character. The grey shiplap walls allow the beautiful black and white tiled floor to star. Mixed metals, antique inspired vanity, and a unique faucet add the perfect touches. 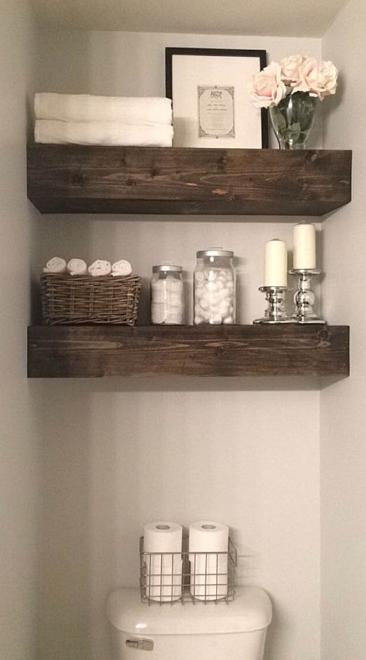 These chunky wood stained floating shelves are gorgeous yet practical. They add beauty and always in demand bathroom storage space. Towels and washcloths get to double duty as decor, along with the other pretty accents. 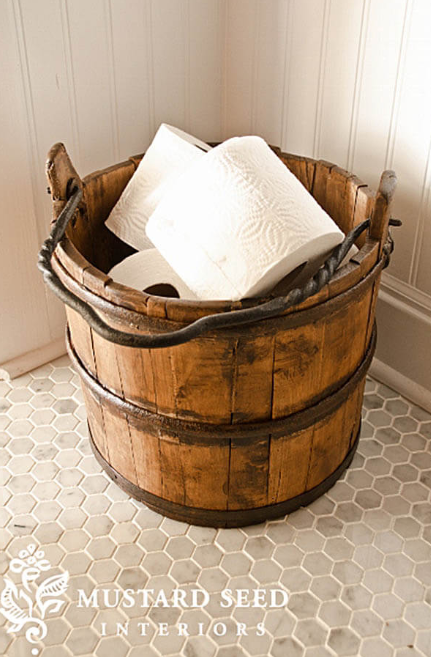 This farmhouse wood and metal barrel is the perfect storage spot for extra toilet paper or other bathroom accessories. It’s convenient and beautiful at the same time. Escape reality for a while in your own bathroom retreat. The standalone tub and white wood paneled walls with a contrasting cream color create a simple and bright oasis. 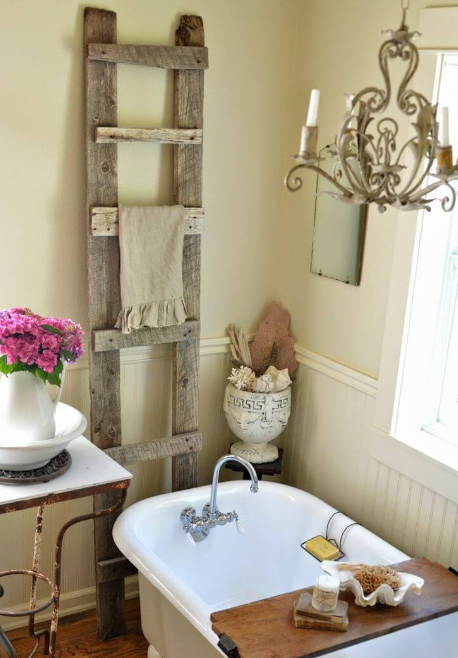 A wood ladder towel holder and floral candle lit chandelier add the vintage feel.